In 2016, Dr. Bauman was named one of America’s Top Doctors® by Castle Connolly Medical Ltd. Award winners of this prestigious distinction are nominated by one or more of their peers, then screened by the Castle Connolly physician-led research team. Those doctors who are among the very best in their specialties and in their communities are selected for inclusion on this list. 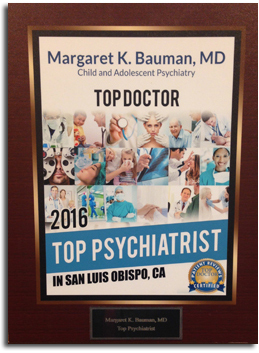 Dr. Bauman has been named one of America’s Top Psychiatrists by the Consumers’ Research Council of America. She has won the coveted Patients’ Choice Award from Vitals.com as well the the Compassionate Physician Award. She appears on the physician Honor Roll on Healthgrades.com.